Outdoors enthusiasts will enjoy browsing the selection of equipment for their day hikes, backpacking adventures, rafting trips, and other outdoor adventures and NOC Gatlinburg. Resting right at the entrance of Great Smoky Mountain National Park, Nantahala Outdoor Center Gatlinburg offers the finest gear for whatever adventure you're planning in the Smokies. The Great Smoky Mountains National Park offers plenty of opportunity for outdoor adventures of all kinds. Whether you choose to hike the Chimney Tops, raft down the Pigeon River, or start your adventure down the Appalachian Trail, NOC Gatlinburg stocks the gear to make your day in the mountains memorable. Black Diamond Equipment - Find this Utah-based climbing, skiing, and mountain gear at NOC Gatlinburg. Chaco - This popular shoe brand can be found at the Gatlinburg shopping destination. Columbia - Nantahala Outdoor Center Gatlinburg offers a wide selection of this popular sportswear brand. Keen - From sandals to hiking boots, find the outdoor shoe brand at NOC Gatlinburg. MSR - This Seattle based company features quality backpacking equipment and can be found at this Gatlinburg shopping spot. Patagonia - Buy this high-end outdoor clothing brand at NOC Gatlinburg. Ospery - Purchase some of the best backpacks at Nantahala Outdoor Center Catlinburg. Vasque - Find this quality footwear brand at NOC Gatlinburg. In addition to these top brands, NOC Gatlinburg offers The North Face Summit Shop. 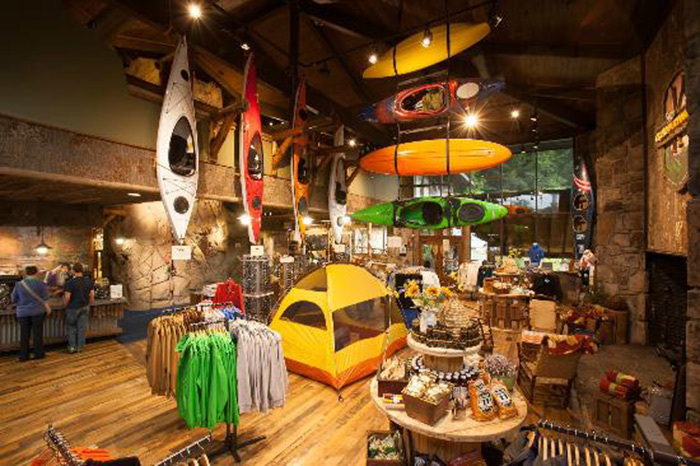 Browse through 1,000 square feet of only the North Face brand clothing, gear, and more at Nantahala Outdoor Center Gatlinburg, making this the Gatlinburg shopping destination perfect for those looking for backpacks and clothing for school, a day hike, or an extended backpacking trip. In addition to the wide selection of merchandise, NOC Gatlinburg's interior boast several features to make you feel like your already on a mountain adventuring, including a swing rock bridge, kid-friendly bear cave, as well as a fireplace to keep warm during those cool winter days. In addition to quality Gatlinburg shopping, NOC Gatlinburg offers several exciting whitewater rafting packages as well as guided hiking tours. From racing down the rapids of the Pigeon River to biking down the trails of the Smokies, there is an NOC Gatlinburg adventure package for everyone's skill level and need for adventure. Stay Close to NOC Gatlinburg and other Gatlinburg Shopping! Want to stay close to NOC Gatlinburg and all of its adventures and Gatlinburg Shopping? Book a stay in one of Cabins USA's Gatlinburg area cabin rentals, ideally located for plenty of outdoor activities in the Great Smoky Mountains National Park or a Gatlinburg shopping trip.